Despite a fairly low interest in producing ‘music’, never having rehearsed beyond one member of the band saying to another “it’s that triangle shaped chord followed by the one that looks a bit like the plough constellation and that’s it”, and a whole lot of bitchy squabbling, the Liberty Caps did get their 15 minutes. 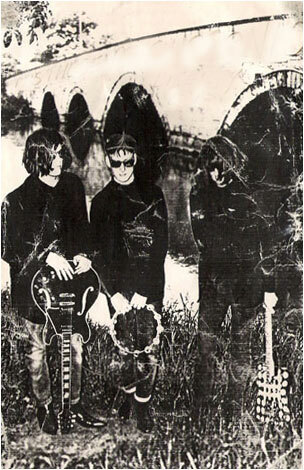 The first show was at a forgotten venue in Coventry with the forgotten original drummer (ousted by fascist dictator Rob who felt there to be too much cymbalism), it was a hyped affair linked to the shooting of Warhol which brought out the entire goth community for no apparent reason. 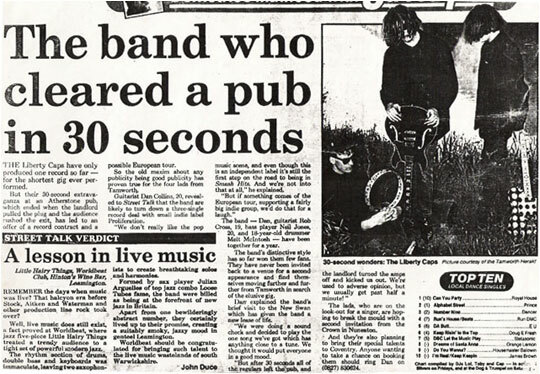 They applauded the first slab of one note feedback but 45 minutes later were screaming obscenities, the fact that they didn’t leave is a testament to the lack of things to do in Coventry (or the value a goth puts on a quid entry fee and the cost of a pint of snakebite and black). The astonishing Melt joined at some point and played a weird house beat on 2 drums whilst introducing the idea of found sound and random sound tapes to the cacophony. Then some bowl headed kid asked the Liberty Caps to play at his dad’s pub having sold his dad on the idea by saying “They’re like Lou Reed” and playing his dad Walk On The Wild Side instead of Metal Machine Music. Come the day of the gig the band plug in to check levels etc. Angry shouting, mass exodus, removing of fuses from fuse boxes. You get the picture – a bad atmosphere. Around this point two ideologies went into overdrive, the pretentious artist and the media hyperbole. The media side got lots of media attention for the 30 second show and the pretentious artist side produced media sound bites (you don’t look at Picasso and say ‘that sounds terrible’). Somewhere in the melee, heavy vibes man M Mortimer had suggested maybe he should spend more time on his actual band, this was of course seen as HERESEY by the other members and he was Stalinised from the subsequent TV appearance (where he was replaced by an afro wigged Neil Jones) and the recording of ‘No Greater Man’, the sole studio recording. Poetic justice then that the Liberty Caps’ one and only Tamworth show should be in the Tamworth Arts Centre (where said TV appearance was filmed) after M’s band, however the Liberty Caps never arrived on the stage at the same time and the performance consisted of a lone Telecaster feeding back for a few minutes. For a band who revealed too much about their state of mind through their name it seems fitting that they ended on a whimper, not a bang. A NEW Tamworth band plays its first ever gig this weekend, The Liberty Caps, who describe themselves as ‘absolutely useless’ take to the stage at Nuneaton’s Crown pub at around 10pm on Saturday night. They feature a guitarist who cannot play a guitar, one who can (a bit), a ‘quite good’ bass guitarist – who will be known to followers of the local music scene – and a drummer who only has two drums. The gig is free, and features an indie/alternative/psychedelic disco, so for something COMPLETELY different, get down there! ‘Loop’ is two minutes of ear-shattering rubbish which sounds strangely addictive. If you’re hard of hearing that is. If you’re not, then you will be. No vocals. No lyrics. Curiouser and Curiouser said Alice. Five…screech…Four…growl…Three…blam…Two…aarrgghh!…One…Kaaabbbooommm!!! There is no more incredible man on this earth than Captain Scarlett…than Captain Scarlett. If you’re a young wacky student or a member of the band – then this is for you. Will, it’s not for me anyway.